The Inovativ 1535 Pro Lite Ultra Kit with DigiShade Universal works with a 13" Apple laptop to serve as a portable and rugged digital photographic workstation. One advantage of this kit is that it helps avoid having to completely disassemble your system when moving from spot to spot. The case is flight ready and carry-on approved for most travel (always check with your carrier before traveling). 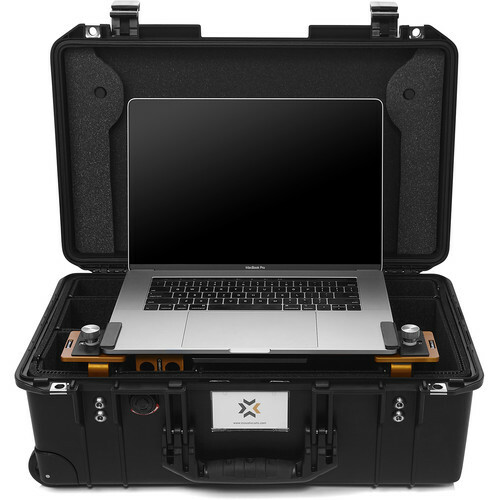 The kit includes the 1535 DigiCase Pro with TrekPak, the DigiPlate Lite, Laptop Universal DigiClamps, Accessory Universal DigiClamps, the DigiShade Universal, a DigiHanger, DigiLegs, and a DigiBase. The 1535 Pro Lite Ultra Kit includes a 1535 DigiCase Pro with TrekPak Organizer, DigiPlate Lite, a set of our new universal laptop clamps that are compatible with Apple's newest 13" MacBook Pro Retina and are adjustable from 0.375 - 1.0", a set of accessory clamps that can accommodate accessories measuring 0.5 - 1.5" in height, the DigiPlate Lite, Laptop Universal DigiClamps, Accessory Universal DigiClamps, the DigiShade Universal, a DigiHanger, DigiHanger, and a DigiBase.